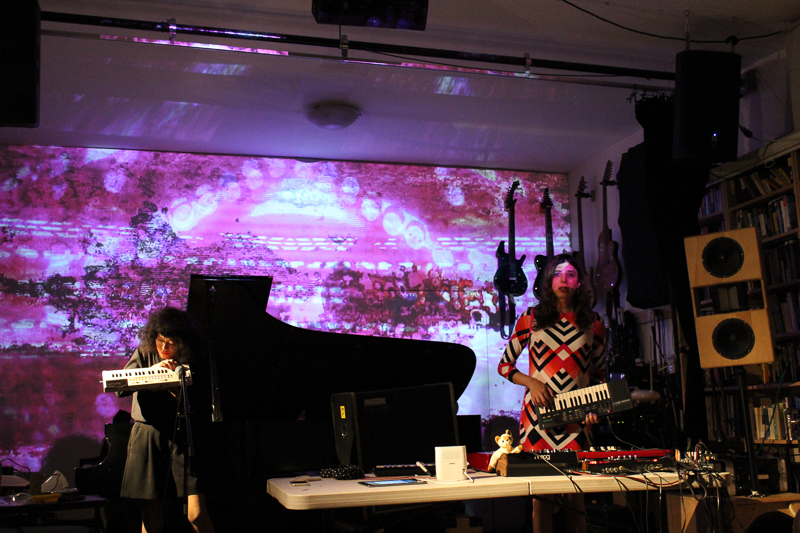 Today we look back at my performance with Tania Chen at Spectrum in New York, a little over a week ago. 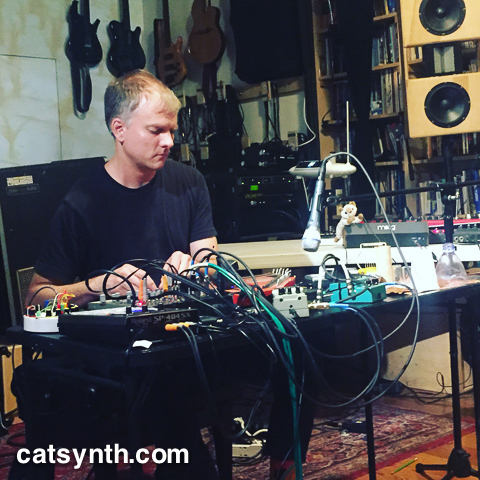 Our duo is built around a mixture of experimental improvisation with electronic instruments and other elements, and songs with lyrics, melodies and chords, often segueing seamlessly from one to the other. Spectrum has a wonderful Steinway grand piano, which allowed to Tania to exercise her piano skills while I focused on chords and rhythm with a Nord Electro keyboard and DSI Prophet 12 and Moog Mother-32 synthesizers. At times the sound was dark and droning, others very sparse, and many times quite humorous – after all, we did sing a “Cheezy Love Song.” The songs themselves were quite structured, but there as well as the improvisations in between we were able to play off one another to create patterns and textures. 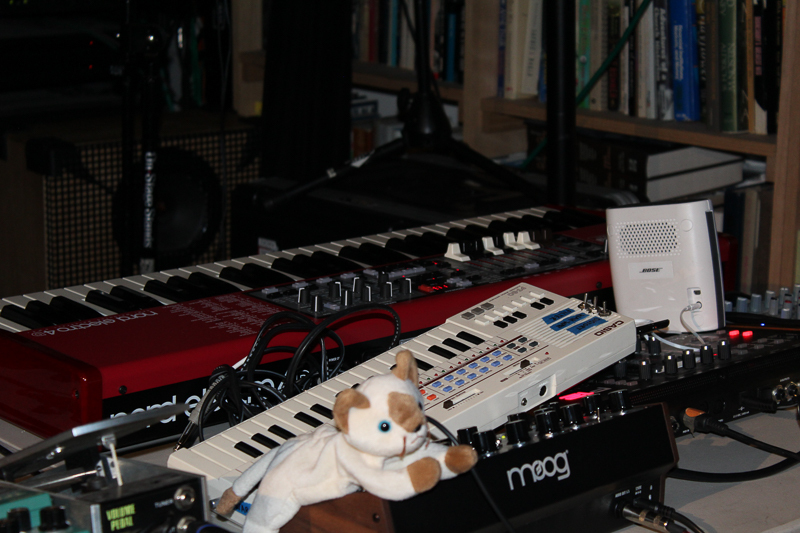 I particularly like the sections combining the acoustic piano with the Prophet 12, and our dueling Casio keyboards. And yes, we had a lot of fun. You can see our full performance in this video below. Overall we had a great time performing and it was quite well received by the audience. It wasn’t actually our first show together in New York. That was at the Brick Theater in Brooklyn and will be discussed in a separate article. Our performance was in the middle of the bill. The evening began with a set by Hey Exit, a solo project by Brooklyn-based Brandan Landis. 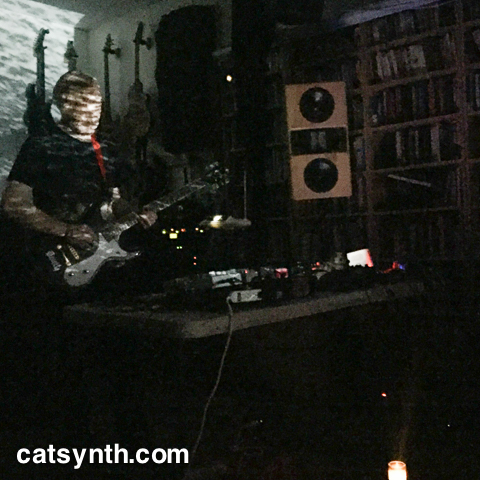 Using guitar, electronics and video, Landis created a dark soundscape, sometimes noisy and drawing from his backgrounds in punk and noise, but at other times quite haunting and ethereal. The room was particularly dark, with light only from the video screen and a nearby candle. Hey Exit was followed by a solo set by Jeff Surak featuring sundry electronic and acoustic sound sources. Much of the set featured long drones with rich timbres, but also details such as beating patterns and occasional breaks in the sound. 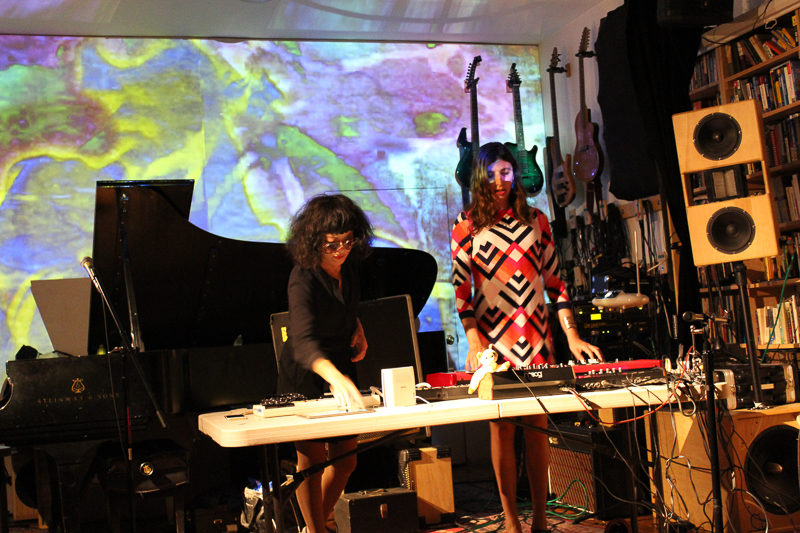 The timbres could be tense at moments, but overall tt was a very meditative performance; and a perfect sonic segue into our very different set. 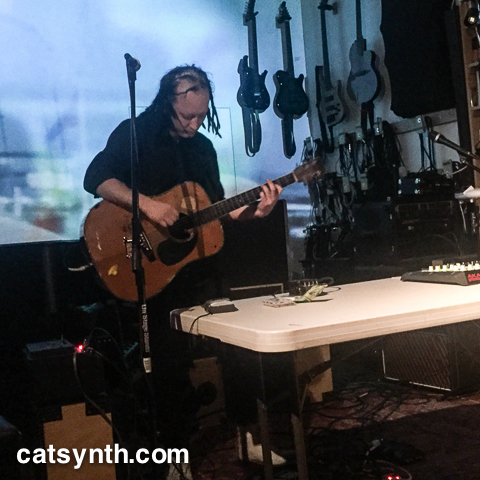 We were immediately followed by Jarvis Jun Earnshaw performing with guitar, voice and electronics. His sound at times was reminiscent of cafe folk singers, but his voice was anxious and abstract. The entire performance mostly followed the pattern of combining these elements with high-feedback delay and other effects. 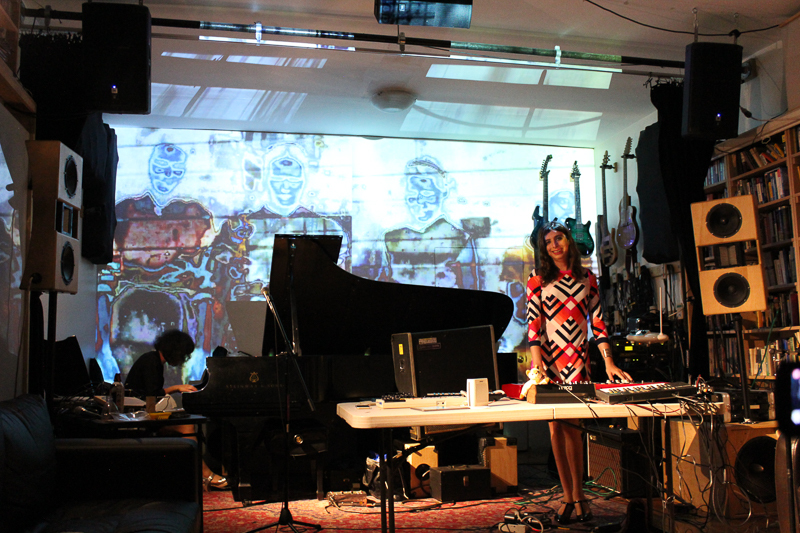 The final set Jenn Grossman, another Brooklyn-based musician and sound artist. 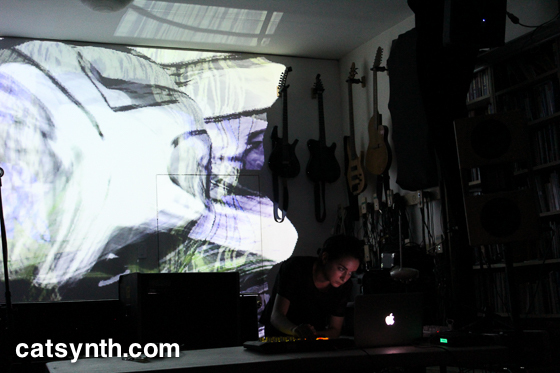 Her electronic set featured vocal experimentation with electronics, including rhythmic and ambient elements. Although also making use of drones, it was very different from Jeff Surak’s sound, more harmonic and thicker, more like a dreamy movie scene versus a tense dark space. There were percussive hits and noisy bits as well, which gave the music a defined texture. It was overall a great experience being back at Spectrum and performing along with all the other acts. And we had a sizable and appreciative audience, despite the space being a little hot that evening. Thanks as always to Robert Pepper (Alrealon Musique) and Glenn Cornet for hosting us, and hopefully I will play there again soon.